The risk of ruin concept is well-known in finance and investing but how can it be applied to sports betting? Why should even profitable bettors be aware of the concept? Read on to find out. In his book Skin in the Game, Nassim Nicholas Taleb presents the following thought experiment, which I have adapted very slightly. 100 persons go to a Casino, to gamble a certain set amount each. Some may lose, some may win, and we can infer at the end of the day what the “edge” is, that is, calculate the returns simply by counting the money left with the people who return. We can thus figure out if the casino is properly pricing the odds. Now assume that gambler number 28 goes bust. Will gambler number 29 be affected? No. You can safely calculate, from your sample, that about 1% of the gamblers will go bust. And if you keep playing and playing, you will be expected to have about the same ratio, 1% of gamblers over that time window. Now instead suppose only you go to the Casino a hundred days in a row, starting with a set amount. On day 28 you go bust. Will there be day 29? No. No matter how lucky you are, you can safely calculate that you have a 100% probability of eventually going bust. The probabilities of success from the collection of people do not apply you. Let us call the first set ensemble probability and the second one time probability (since one is concerned with a collection of people and the other with a single person through time). Now, when you read blogs by betting analysts or tipsters based on the long term expected returns, beware. Even if their forecasts were true, no person can achieve the expected returns of the market unless he has infinite pockets. They are conflating ensemble probability and time probability. If a bettor has to eventually reduce his staking because of losses, his returns will be divorced from those theoretically expected, period. Of course it’s a statement of the obvious that casino gamblers who play games designed purely around statistical algorithms (roulette and craps for example) will inevitably go bust in the end. The same will be true for unskilled bettors who will eventually be ground down by the bookmaker’s margin. Betting, however, is different to the casino because there is the theoretical possibility for players to show profitable expectation, provided they are better able to determine ‘true’ outcome probabilities than those who lay the odds. Nevertheless, Taleb’s thought experiment is useful in this respect: it reminds even advantage players to think about the possibility of ruin. You might be a superb forecaster, but if an unlucky sequence of play wipes out your bankroll, that’s it. There will be no next day. In the remainder of this article, therefore, I want to spend a little time examining the risks of ruin faced by advantage bettors. Betting is a combination of luck and skill. How do we know when a bettor shows any of the latter? Last year I discussed the use of a statistical test – the Student’s t-test – that might help us answer this question. By its nature this test can’t actually tell us directly whether a bettor is skilled at forecasting and achieving a long term profitable expectation. All it can do is calculate the likelihood of a set of profits and losses occurring if nothing other than chance is operating. When that likelihood is small, however, statisticians will happily make a leap of faith and assume that something other than chance is probably at work. Typical benchmark figures applied in this context include 5% and 1%. In other words, when there is a less than 1% probability that a betting record will have arisen by chance we might argue that it’s likely the bettor responsible for it is exhibiting some skill. There are numerous problems with making such a bold prediction, not least the issue of survivorship bias: we often only get to see the best records, not all the other mediocre or losing ones. If there are 100 bettors in a population and the best one has a 1-in-100 profits history, what is that really telling us? Unfortunately, we rarely get to see the whole population. Nevertheless, for this article I will assume that a 1-in-100 record provides some evidence of an advantage bettor. Whether it really does is perhaps not so relevant to what follows. Since lucky bettors will ultimately regress to the mean, the following data might be considered best case scenarios. What is the probability a bettor will face ruin during a series of bets? This depends on a number of variables, including how skilled (or lucky) they are, how long they bet for, the odds they choose to bet at and the stakes they choose to place. It is self-evident that the more superior (less unlucky?) the bettor, the less likely they are to lose all their bankroll. We should also be familiar with the fact that the longer the odds we bet, the greater the variance in outcomes. 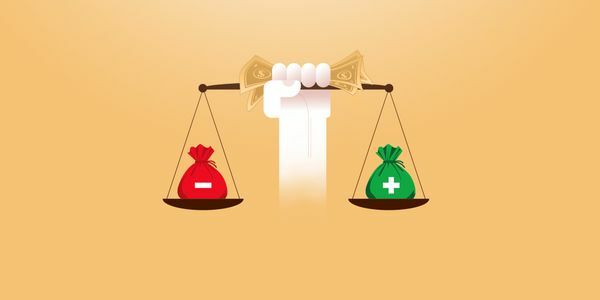 Greater variance means a wider range of possible profits or losses, greater risks and hence a higher probability of ruin, all other things being equal. And the larger our stakes are as a proportion of our bankroll, unsurprisingly the greater the likelihood that an unlucky streak will wipe us out. Bettors who bet longer odds will also typically show larger percentage returns than those betting at shorter odds because of the greater variances. To put it another way, an equivalent return from longer odds has a greater contribution from luck. It is for this reason that you will find racing tipsters (who typically bet longer odds) with bigger published returns than sports betting tipsters (who typically bet shorter odds). Of course, for the same reason you will find racing tipsters at the bottom of tipster league tables with larger losses (because of the influence of bad luck). The following table shows the profit expectations for profitable 1-in-100 bettors placing 1,000 wagers for different odds, calculated using my t-test calculator. 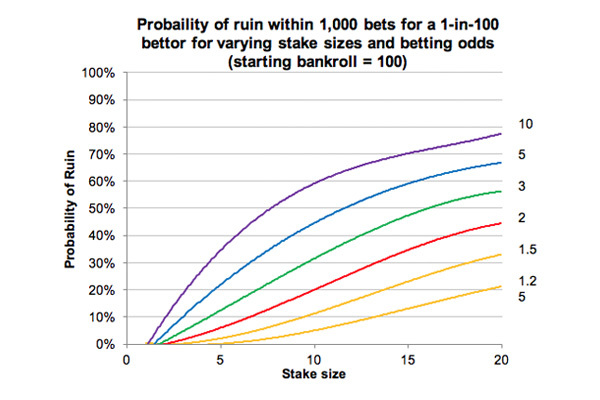 From a 10,000-run Monte Carlo simulation the following chart illustrates how the risk of ruin varies for different 1-in-100 bettors placing up to 1,000 wagers with varying betting odds and stake sizes. It is assumed the bettor starts with a bankroll of 100 and stake sizes are fixed. Unsurprisingly, larger stakes increase the risk of ruin dramatically, especially when betting at longer odds. Let’s say you have a preference for betting on racing longshots at prices of ten. Despite holding a theoretical profit expectation of over 24%, you’ll never even make it to 1,000 wagers on more than 60% of occasions if you bet ten units stakes from a starting bankroll of 100. Naturally, the majority of longshot bettors will choose to appropriately scale down the size of their stakes, but that necessarily implies they will make less absolute profit. The impact of managing ruin-risk on absolute profits. Let’s suppose we consider a 1% risk of ruin to be the maximum acceptable. For a bettor betting odds of ten, their stakes can be no more than one unit for a 100 starting bankroll. By contrast, for the bettor betting much shorter odds of 1.25, they can risk stakes of six units. Consequently, despite the longshot bettor having a much higher profit expectation, they will actually end up with about the same absolute profit as the bettor who bets on strong favourites. Another example: suppose the acceptable ruin-risk is about 20%. A bettor betting odds of five should stake about five units. In contrast, the bettor placing bets at odds of 1.5 can stake about 15 units. The former has a profit expectation about three times the latter. Hence, again they’ll both end up with about the same absolute profit expectation. There is a clear and on obvious conclusion here: for bettors with equivalent skill levels, accepting equivalent risks of ruin implies that it makes very little different what odds you bet at. Targeting longer odds because they offer more percentage profit expectation must be counter balanced by managing an increased risk of ruin by reducing stake sizes. Buffet and Taleb are right. Ruin changes the expectancy calculation. When we attempt to estimate expected profitability, we do so by ignoring all those occasions where our betting sequence is cut short. The estimated profit expectancies in the table above all assume 1,000 wagers. Evidently, when the probability of ruin is non-zero not all sequences will last that long. Consider a bettor placing wagers at odds of two at stakes of 10 units. They face a 23% risk of ruin within 1,000 wagers. In my 10,000 betting history simulations, 95% of those sequences that experienced ruin theoretically went on to show a profit with an average return on investment of 105.74%. But in reality, those profits would never have happened, because there is no next day for the ruined bettor. If we want to keep real expectations as close as possible to their theoretical counterparts, we must minimise the risk of ruin to very small levels. Intuitively, most serious bettors understand this, but the analysis here will hopefully quantify these ideas. What is very clear is that for even skilled advantage players, to hold the probability of ruin to levels significantly below 1% we cannot entertain stake sizes much beyond 1% of an initial bankroll, and smaller still if betting at longer odds. And when we actively think about our risk of ruin it becomes clear that the type of odds we might choose to wager makes very little difference at all.